Missouri State Parks is trying to “deobligate” $72,328 from a Recreational Trails Program (RTP) grant the city of Belle was awarded in 2014 to develop a trail on the former Rock Island line. Ameren UE, which owns the former rail line that is in the process of being railbanked, is prepared to turn it over to State Parks — if they want it — for development into a hiking and biking trail. Belle received the RTP grant to develop a portion of trail through the city limits. The letter from Rost states the Missouri Trail Advisory Board (MTAB) made the decision April 7 when they met to discuss current and upcoming trail projects. “The way it reads to me they are wanting to pull our grant for our part of the trail,” Seaver told Belle aldermen on Monday night. The grant was awarded to build more than one mile of trail from downtown to the city park and requires a 20 percent match The city’s treasurer has kept $75,328.06 on the books for the project as of June 30, 2018. The city, Belle Friends of the Trail, Missouri Rock Island Trail, Inc. (MORIT) and trail supporters have done much to prepare for the project and keep the corridor clean. Rost’s letter says State Parks is still working on their due diligence, but has not yet reached a decision as to whether to proceed. Missouri State Parks is currently working on a plan for the state to accept the remaining 144 miles of the Rock Island corridor for use as a State Park. This section will connect Windsor, where the Rock Island Trail meets the Katy Trail, with Beaufort, near Washington, MO, where a relatively short link would connect the Rock Island back to the Katy. 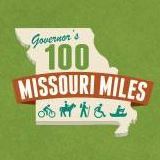 Missouri State Parks has indicate to us and to MoRIT that they are working on a detailed plan this summer and fall, in anticipation of a decision whether or not to accept the 144 mile corridor that Ameren is ready to donate to State Parks later in 2018. It is difficult to know what to make of the recent letter regarding the Belle trail grant. On the one hand, the grant has been long delayed simply because the Rock Island Trail decision itself has been delayed. The project cannot proceed unless use of the trail is guaranteed for at least 20 years. On the other hand, State Parks knows the decision about the trail corridor will be made later this year, and it seems to make the most sense to delay any decision about the grant until that time. So why the letter now? It could be that is simply the regular time line for the grant committee. Grant committees typically monitor project progress and projects that are behind schedule. They encourage projects that are not making forward progress to return grant dollars so that they can be used on the many projects that are active and can use the funding. The letter could be nothing more than the committee's regular work to address issues with delayed projects. If so, given the circumstances Belle can probably request another extension for a few more months without any great issue. 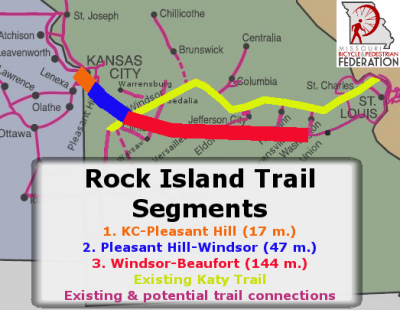 More about the Rock Island Trail, Missouri's potential new cross-state trail, on our Rock Island Trail page. Detailed map of the potential complete Katy/Rock Island Trail system here.